The Headless Horseman is an American silent film adaption of Washington Irving's "The Legend of Sleepy Hollow." 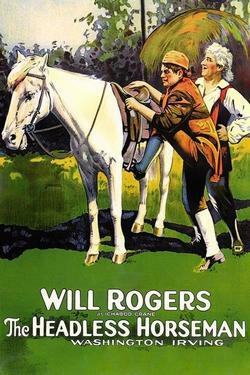 Directed by Edward Venturini and starring Will Rogers (as Ichabod Crane), Lois Meredith (as Katrina Van Tassel), and Ben Hendricks Jr. (as Brom Bones), The Headless Horseman was the first feature-length movie to use panchromatic film, which produces realistic reproduction of scenes as they appear to the human eye, though only in black and white. In addition to being a classic Hudson Valley story, with many scenes shot in and around Tarrytown, The Headless Horseman will be of interest to Rocklanders for its local connection: a principal setting for the action is Van Houten's farm in Nau­raushaun, about a mile east of Pearl River. Morris Van Houten, who owned the property during the filming in 1922, rented the exterior of his sandstone home to the film company, which chose the location because it looked like a typical Hudson Valley Dutch house that could have been used as a tavern. The leading lady, however, insisted on having a room in the house to change costumes and freshen up, and Mr. Van Houten agreed. 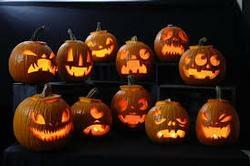 Will Rogers probably changed his costumes in the barn. Look for scenes filmed on the lawn and those featuring the Van Houtens' horses. In honor of Halloween, we'll screen the full 72 minute version of the film, complete with music. For this family-friendly program, people of all ages are encouraged to come in costume. Also during the day of November 1, we'll be happy to receive donations of your used, carved jack-o-lanterns to decorate the site for the evening. As a courtesy to fellow guests, please arrive early to avoid interruptions. The screening will begin promptly at 8:00 pm. Latecomers with reservations may forfeit their seats. Walk-ins will be admitted only if space permits.